The American Association of Pediatrics’ (AAP), has recommended a ban on infant walkers as a result of a recent study that revealed over 230,000- children less than 15 months old were treated for infant walker related injuries in U.S. emergency departments from 1990 to 2014. The majority of injuries were to the head or neck noting that the injuries were sustained by falling down stairs in their infant walker. HealthyChildren.org states that most walker injuries happen while an adult is watching. Even the most attentive parent or caregiver cannot respond quickly enough to prevent a child from falling since a child in a walker can move more than 3 feet in 1 second. That is why walkers are never safe to use, even with an adult close by. Stationary activity centers – They resemble walkers without wheels. They often have seats that rotate, tip and bounce. Play yards or playpens – These can be used as safety zones for children as they learn to sit, crawl or walk. High chairs – As your child grows, they can enjoy sitting in a high chair to play with toys on the tray. Before 1997, there weren’t any standards for baby walkers in place. These standards caused manufacturers to make the base of a walker wider so as to not fit through most door ways and having brakes that stop them at the edge of a step. Although necessary, these improvements cannot and have not prevented all injuries from walkers. Research has shown that walkers do not provide any advantage to accelerating a child’s development. In fact, they may hinder development because they do not teach infants to walk. 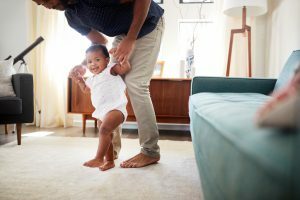 A better practice is to allow your baby the freedom in a safe environment that allows them the opportunity for pulling themselves up, creeping and crawling. This entry was posted in Health, Parenting and tagged dangersofinfantwalkers, infantwalkers by Joann Ariola. Bookmark the permalink.